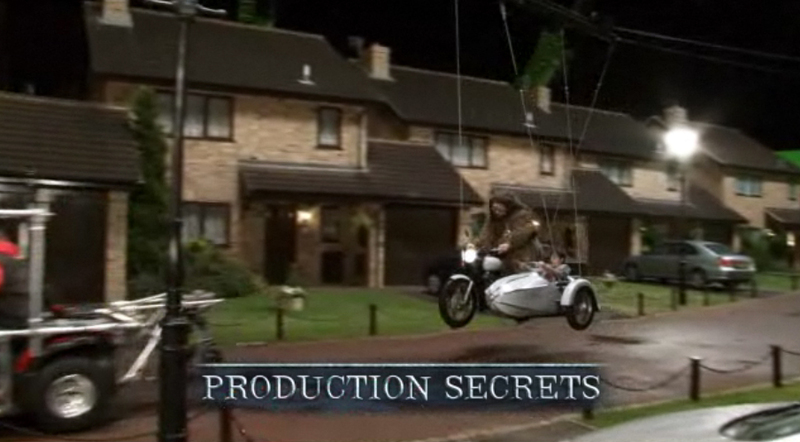 Harry Potter's flying Royal Enfield (some strings attached). It's all about the Royal Enfield motorcycle and sidecar. Or, so you would think, viewing the newest trailer for the Harry Potter and the Deathly Hallows movie, now available on Blu-Ray. 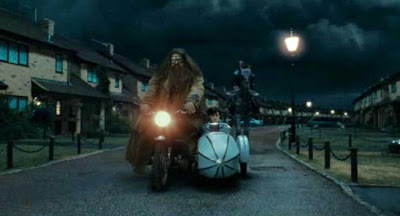 The trailer features Harry's ride in the sidecar of a Royal Enfield more than any other scenes from the movie. The trailer opens with "HOLD TIGHT HARRY!" and off we go on a flying Royal Enfield motorcycle ride. The Blu-Ray "Combo Pack" comes with behind-the-scenes extras like "Production Secrets." Well, how do you think they made the motorcycle fly? No digital hocus-pocus there. They strung it from wires! Some clever chap must have wired the suspension not to go full slack, as the wheels appear to stay where they belong instead of hanging limp. The trailer is very powerful. It doesn't so much make me want to watch the movie on Blu-Ray as it does make me want to go for a ride on my flying Royal Enfield Bullet. Harry Potter and the Royal Enfield in Blu-Ray trailer. I haven't seen the film so please allow me to ask this question. Does the film include the part where they're off to the side of the road with a seized piston? ^Harry is ultimately caught by the Death Eaters due to Hagrid's inability to adjust his points properly. The movie was horrible, turn it off after the Enfield segment and you will be better off for it. I watched this last night and was so excited. This looks really good and I know from seeing this, they lived up and even higher to my expectations. The sets and special effects and of course the acting seems like it will be the best in this part of the movie.